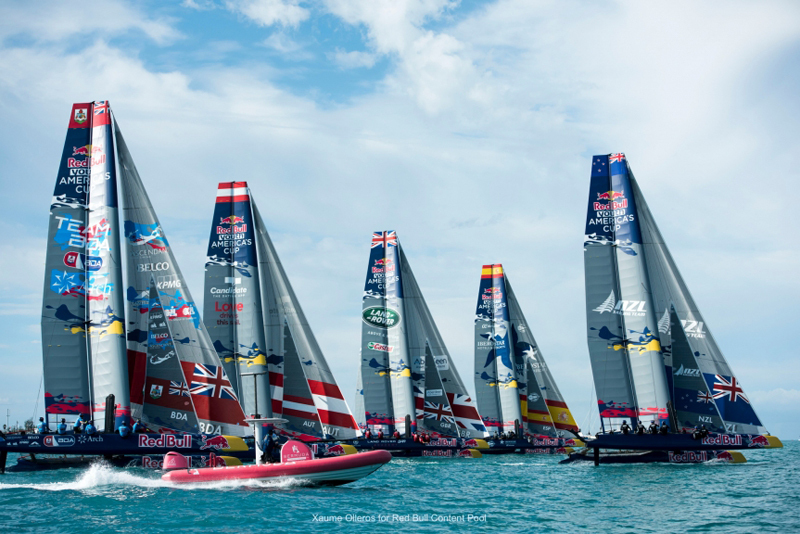 It is day two of the Pool B Qualifiers for the 2017 Red Bull Youth America’s Cup, with the six teams that kicked off the action on day one back on board their AC45Fs on the Great Sound to fight for the four spaces available in the 2017 Red Bull Youth America’s Cup Finals. Yesterday [Monday] saw the start of the competition commence with the six teams in Pool B kicking off their qualifying campaigns with three fascinating races in light winds. At the end of day one it was the British team Land Rover BAR Academy who finished on top of the leaderboard, followed by Spanish Impulse by Iberostar and then local favourites TeamBDA, who finished the day in third place overall after a highly impressive first day of race action. Tied with TeamBDA are NZL Sailing Team, and then Next Generation USA and Candidate Sailing Team fill the fifth and sixth places. Day two racing is scheduled to start at 5.00pm AST and three more races are planned. Come on guys, you can do it!!!! This race could be yearly no? We should syndicate this race…market airtime advertising worldwide and offer a prize from advertising dollar. We need research on feasibility and choose competent marketing agencies…who have equal skill set.incorporate Bermuda llc it etc…brand BDA not unlike AC….and host until our hearts content. Don’t over reach….remember invest to make a profit add shareholders…invite ex A.C. people to take part add them into expence.